Get the latest product releases and other news from FPE Automation here! Teledyne DALSA, in partnership with Fluid Power Engineering Company, invites you to attend a special, high-quality and information-rich vision event where you will learn about the latest industry products and gain real experience working with Teledyne DALSA systems. Space is limited. Make your reservation today! Following the session, we’ll host a special Q&A session. We will be prepared to answer any questions about your actual application that you may have. Bring in an example from your work environment and our experts will be there to assist you. This email was sent to you because your email address is on the Fluid Power Engineering mailing list. To remove yourself from the list unsubscribe. 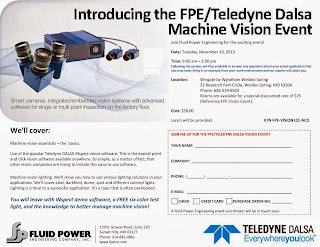 Attention: Greater St. Louis Area Customers - FPE/Teledyne Dalsa Machine Vision Event Coming Soon! FPE and Teledyne Dalsa will be hosting one of our popular Machine Vision Events in the greater St. Louis area this November. This event is always a favorite because it offers real, hands-on discussion about machine vision. No fluff. In fact, if we haven't covered what you came to hear, we offer a roundtable discussion with the experts following each and every event where you can bring actual application questions from your work environment and our experts will assist you. Click the flyer below to get all the details. Hope to see you there! Machine vision essentials – the basics. Use of the popular Teledyne DALSA iNspect vision software. This is the easiest point and click vision software available anywhere. So simple, as a matter of fact, that other vision companies are trying to imitate this easy-to-use software. Machine vision lighting. We’ll show you how to use various lighting solutions in your applications. We’ll cover axial, darkfield, dome, spot and different colored lights. Lighting is critical to a successful application. It’s a topic that is often overlooked. You will leave with iNspect demo software, a FREE six color test light, and the knowledge to better manage machine vision! FPE has a rare opening in the Rockford area, due to the upcoming retirement of a very successful sales rep. who has been with the company for decades. Opportunities like this don't come up often! Fluid Power Engineering is an amazing place to work. You'll work alongside some of the best in the business. The management team is energetic, dynamic and intent on growth. The inside staff is exceptionally talented, knowledgeable and helpful. You'll receive salary, commission, bonuses and expenses. You'll walk right into a mature, established territory. We're looking for the right individual, with a proven track record in achieving new market share and at least three years experience. If that describes you, we'd love to talk. Send Resumes only to: fpeinfo@fpeinc.com, attention: Sales Manager. Fluid Power Engineering is an Equal Opportunity Employer. Great News for the Food Industry! The New Tolomatic ERD25/30 Hygienic Design is USDA Certified! Tolomatic has added two new larger sizes to the ERD product line with hygienic designs that have been officially certified by the USDA for maximum protection against food contamination in the food and beverage processing industry. 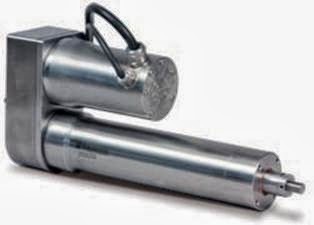 In addition to the round body with smooth edges, welded joints and PTFE self-lubricating seals with either IP67 or IP69K options, these actuators increase the force capacity of the ERD family to 4,500 lbf (20.03 kN). Would you like to set up a demo, or just get more information? Contact your FPE Solution Specialist for details.